As I post this, most gamers are probably either playing Mass Effect: Andromeda or counting the minutes until they can (myself included). I’m sure I’ll have plenty to say on it soon enough, but in the meanwhile, there’s another game I’d like to discuss. 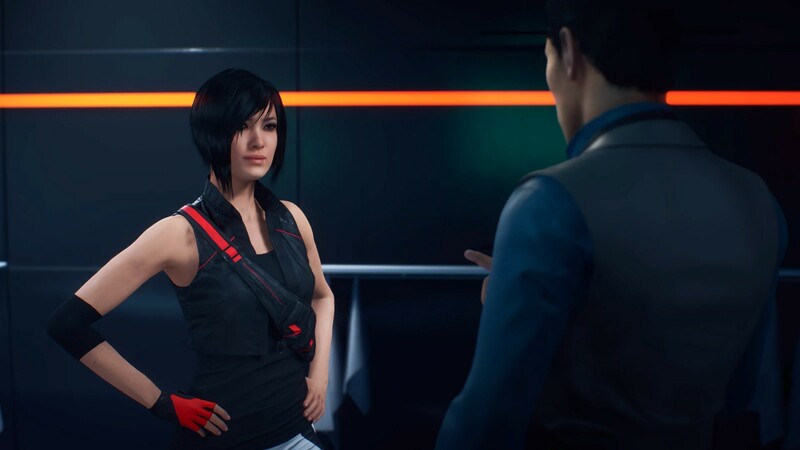 I had planned to spend the month leading up to Andromeda focused on World of Warcraft, but some happenstance had me splitting my attention with another game, Mirror’s Edge Catalyst. While looking for info on Andromeda, I discovered that Origin was offering a free trial of its subscription service, which allows you to play a number of games for no additional cost. I’d long had my eye on Catalyst but wasn’t willing to drop the dough without trying it first, so this was a great opportunity. After a couple hours of play, I knew I wanted to see more, and it also happened to be on sale for a generous discount, so I bought the full version of the game so I could playing even after the free trial ran out. It’s an interesting game, though I do have some conflicted feelings on it. 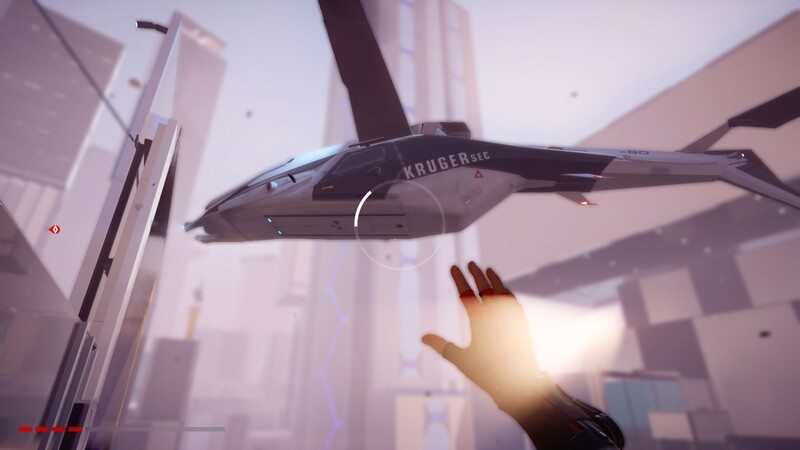 Catalyst is a reboot of the Mirror’s Edge franchise. It has roughly the same general concept as the first game, but there’s no continuity between them that I’m aware of. They’re starting fresh. 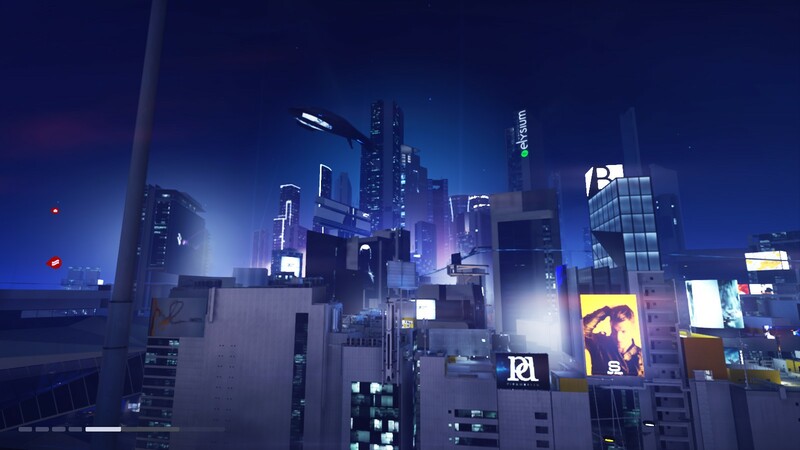 Catalyst takes place in the futuristic city of Glass, a glittering metropolis whose pristine beauty conceals dark secrets. In Glass, nearly all information is digitized, and therefore vulnerable to hacking. The only way to prevent this with total certainty is to go old school and deliver letters by hand. To this end, a strange subculture of “Runners” has developed, elite agents operating in a legal gray area, darting across the roofs of Glass to ferry packages and information. 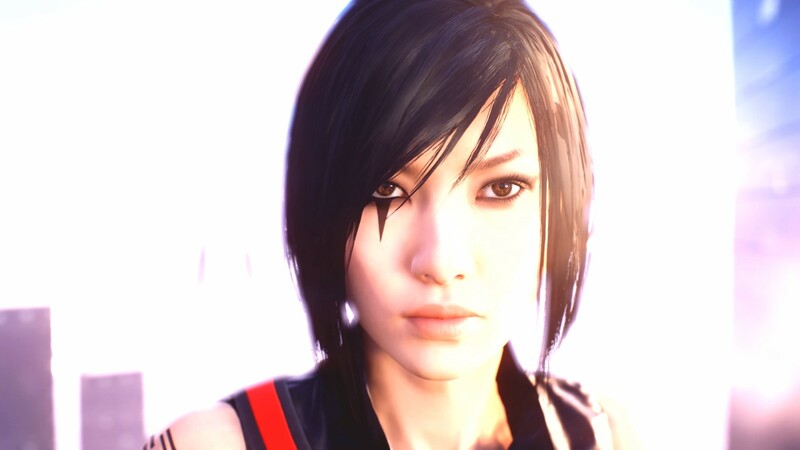 As in the original Mirror’s Edge, the star of the game is a young Runner named Faith Connors. At the beginning of the game, Faith is released after several years spent in prison and resumes her life as a Runner. But Faith’s reckless curiosity soon finds her drawn into a dangerous conspiracy that threatens to end what little freedom exists in the shining prison that is Glass. The gameplay is focused on high octane first person platforming as the player uses Faith’s speed and parkour skills to navigate the city, solve puzzles, and defeat her adversaries. Long-time blog readers may know I have some history with Mirror’s Edge. I remember seeing a preview of the first game on Electric Playground many, many years ago and instantly falling in love with the concept, but when I finally got around to playing it, I simply couldn’t. I never was very good at jumping puzzles, and I became hopelessly roadblocked shortly after finishing the tutorial. The good news is that the answer is yes. I won’t profess to be particularly good at it, and there were still more than a few occasions where I screwed up and left a small crater, but that wasn’t the sum total of my experience this time, and I managed to finish the story, at least. The funny thing is I’m hard-pressed to determine what the difference is. Catalyst offers more or less the same gameplay using more or less the same controls, and yet the difference is night and day. The first game was unplayable for me, but Catalyst just… works. I don’t know how else to describe it. It’s a hard game to rate because it can be thrilling and frustrating in equal measure. Leaping, climbing, soaring, zip-lining, and wall-running across Glass is incredibly enjoyable — poetry in motion — when everything is going well. When things aren’t going well, it can get ugly. The combat is the same way. Faith has access to a few basic martial arts moves, but on their own they’re woefully inadequate to deal with the heavily armed goons she finds herself up against. To level the playing field, you need to take advantage of the same acrobatic movement that gets you around the city. Faith can literally run circles around her enemies, and the more momentum she can maintain, the stronger her offensive and defensive capabilities are. When you get it right, this makes combat spectacularly satisfying. There is no way for me to adequately communicate in text how much fun it can be to flow like water around your enemies, to wall-run into a flying kick or leap off a zip-line and crash into a guard like a freight train. But it’s a very finicky system. When it works, it’s brilliant, but it doesn’t always work, and then combat just turns into a flailing awkward mess. Combat is a relatively small part of the game, though, and interestingly it is often possible or even advisable to avoid fighting altogether. You can simply outrun your enemies. 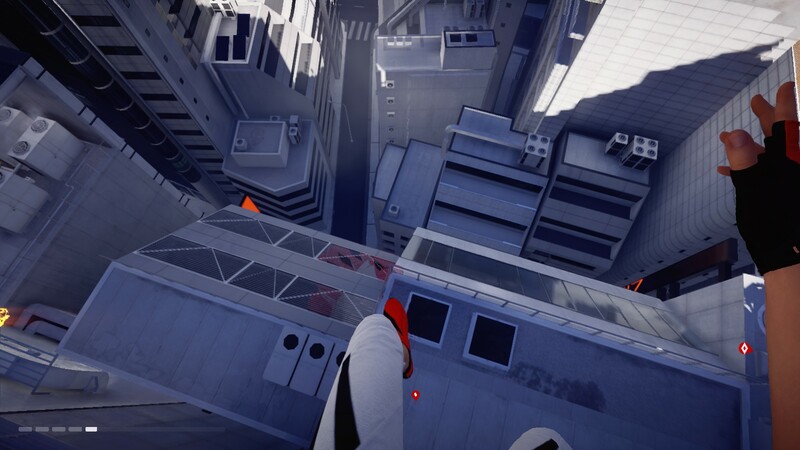 Unlike a lot of video games, Mirror’s Edge is fundamentally about wits, not brute force. Enemy soldiers are more of an extension of the game’s puzzle nature than anything. The goal is not to kill them, but simply to stop them from killing you. On a similar note, I do find it interesting that Faith as a character has no particular super-powers or exceptional abilities. She’s very fast, agile, and smart, but not inhumanly so. She’s not enhanced in any way, nor does she have elite military training or any of the other inherent advantages most video game heroes have. I like playing super-powered characters, but Faith’s relatively ordinary nature is a refreshing change of pace. One difference between Catalyst and its predecessor is that it is now an open world game, which is another thing that has its pros and cons. On the one hand, I love the actual open world part. Movement is such a joy in this game that I love the option to just run around and explore the city at leisure, and there are lots of little collectibles that are just rewarding enough to make exploration feel useful, but not mandatory. Conversely, though, Catalyst has also inherited many of the sins of the open world genre, like a preference for quantity of content over quality. The game is overflowing with side-missions, time trials, and other random activities that are for the most part just dull. The good news is you can skip pretty much all the optional content and not miss out on anything important, so that’s what I ended up doing. The one side activity that is a little interesting is billboard hacks. These allow you to hack into electronic billboards so that they display your Runner’s mark, a customizable sigil. Oddly, you can’t customize it in-game; you have to go to the game’s website, which is less than convenient. 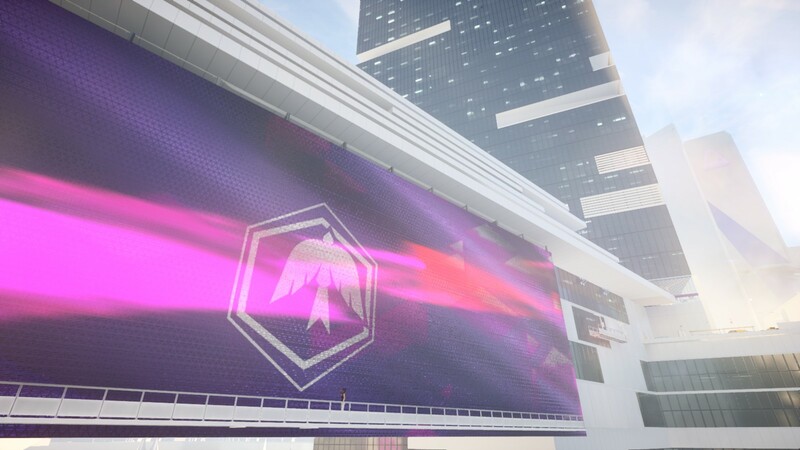 Still, it’s a neat idea, and it can be gratifying to see your personal sigil shining over the city for the rest of the game. 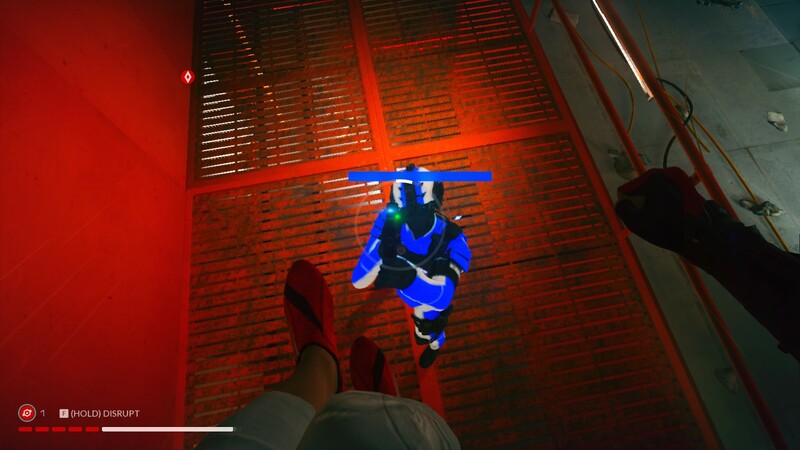 One other thing that needs to be said about the gameplay is that Mirror’s Edge Catalyst is not at all a relaxing game. In fact its constant “go-go-go” mentality can make it quite physically and psychologically exhausting at times. It’s a very interesting game. It will challenge your intellect and your reflexes, and it can be both fascinating and satisfying, but it’s not something I’d recommend if you’ve had a long day and need to unwind. The story, meanwhile, is mostly enjoyable, though a bit on the basic side. I played so little of the original that it’s hard to compare the two accurately, but based on what little I saw, the original seemed to have a bit more personality. I made my Mark purple, of course. For the most part there’s very little to set Catalyst apart from any number of other sci-fi dystopias where corrupt corporations rule the world (a genre which seems increasingly prophetic by the day). It works, and it does get pretty exciting near the end, but it’s not especially surprising. What twists there are can easily be seen coming. The ending is also fairly inconclusive and clearly intended to set-up a sequel, which may or may not actually happen. I did really like the cast of characters, though. Faith is a great protagonist; she’s tough, but not to an unrealistic degree, and she still feels very human and relatable. Her recklessness and curiosity remind me of Leha a bit. The rest of the cast isn’t quite as impressive, but they’re still pretty solid characters. For a game that isn’t particularly long or story-driven, they have a lot of depth and development, even the ones that seem one-dimensional at first. The one exception is Plastic, who is as artificial as her name would indicate. It’s one of the more diverse casts I’ve seen in a game, too, which is always nice to see. Graphically, I imagine this is a very good-looking game on a powerful machine, but as previously discussed, my rig was showing its age when I played it. Catalyst ran well enough, but the textures just never seemed to display quite right, and it did get a bit sluggish or laggy at times. The funny thing is that no amount of tinkering with the graphics settings seemed to affect any of these issues. At least the cinematics looked good. One other thing that I did really like is that you actually have a body in this game. If you look down, you’ll see Faith’s feet and legs. If you grab onto a ledge, you’ll see her hands. It seems like such a small thing, but I found it made the game vastly more immersive than the standard first person game where you’re just a disembodied head. Mirror’s Edge Catalyst is a very hard game to rate. I’m coming away with more positive feelings than negative ones, but there’s no shortage of either. One other amusing thing to note: Early in the game, you’ll encounter a jukebox you can activate to play music in-game. This is hardly a radical idea at this point, but imagine my joy when the very first song to be played was by none other than Chvrches, one of my most beloved bands of all time (though ironically not the one referenced in the sub-header). Now, I knew they’d done a song for the game, so it didn’t come as a total shock, but it was a great way to be welcomed into the game. Needless to say my progress ground to a halt as I listened to the song. This entry was posted in Games, Reviews and tagged Mirror's Edge, review, sci-fi by Tyler F.M. Edwards. Bookmark the permalink.